Over the years more competitive categories were added along with the practice of selecting winners from a list of nominees. In 1949, the first best musical award went to Kiss Me, Kate, veteran composer Cole Porter's take on Shakespeare's Taming of the Shrew. By the mid-1950s, the Tony Awards ceremony had become a larger, more formal event broadcast live on local New York television. Filichia, a theater blogger and columnist who was for many years the theater critic for the Newark Star-Ledger, points out that it was nationwide television exposure, beginning in 1967, that truly boosted the Tony above other theater accolades. "Looking at print ads for Broadway in the 1950s and early 1960s prove that shows that had won prizes used to advertise first and foremost 'Pulitzer Prize Winner!' or 'New York Drama Critics Circle Winner!' much more often that 'Tony-winner!'" Filichia told The Committee Room. "Now no other theatrical award can touch the power of the Tony, because of that two-hour television infomercial that runs on a Sunday in June. And while ratings are a fraction of what they used to be (which, to be fair, is true of every network television show), the broadcast still reaches millions of people who say, 'Hmm, that show looks good' and reach for their telephones to call Telecharge." Tonys preferred Avenue Q in 2004. Other popular shows that did not win the Tony for best musical are Oliver!, Mame, Sweet Charity, Hair, Promises, Promises, Pippin, Grease, Chicago, Sunday in the Park with George, and that mega-hit of the past decade, Wicked. Filichia reminds us that the Tonys reflect how shows were seen in its time, not what we think of them years later. Lerner and Loewe's Camelot is a beloved classic but it opened on Broadway in 1960 under the shadow of Lerner and Loewe's earlier My Fair Lady, a critical and commercial smash that was still going strong at the box office nearly five years after it opened. Camelot wasn't even nominated for best musical. The snub was heightened by the Tony Award committee leaving a nomination slot empty. "Is there any fact that better proves what a tremendous disappointment Camelot was at the time?" Filachia writes in Strippers, Showgirls, and Sharks. Some theater seasons present stronger competition than others. Filichia cites the example of Big, David Shire and Richard Maltby, Jr.'s musical version of the Tom Hanks movie. Big opened on Broadway in the spring of 1996. "The money was in place to produce it during the 1994-1995 season, but that was the same season in which Sunset Boulevard was opening," Filiachia told TCR. "The producers said, 'Oh, we’ll never win the Tony against that Andrew Lloyd Webber juggernaut, so why bother even trying? Let’s wait a season.' Well, yes, Sunset Boulevard indeed did win the Tony as Best Musical, but in a season where its only competition was Smokey Joe’s Café. I will always maintain that if Big had opened that season, it would have won the Tony, because the time was right for a Lloyd Webber backlash and many would have said 'Oh, Big is so all-American, so fresh and breezy!' But the producers waited until the next season, when Rent opened – which had the emotion attached that its author [Jonathan Larson] had prematurely died as well as the incontrovertible fact that the Baby Boomers now rich enough to attend the theater wanted to hear rock music – and Big didn’t have that." Back in the 1957-1958 season West Side Story and The Music Man competed for best musical along with three lesser offerings -- New Girl in Town, Jamaica, and Oh, Captain!. The winner was The Music Man. Whether this tale of a conman inadvertently bringing joy to a dour little town in turn of the century Iowa was superior to West Side Story and its tragic gang rivalry in a contemporary Manhattan slum, is arguable but it was certainly more cheerful. Filichia notes that the best musical Tony usually goes to upbeat shows. He recalls gasps from the audience at the Tony Awards ceremony for the 1971-1972 season, when Stephen Sondheim's Follies, a gut-wrenching masterpiece of despairing middle aged couples attending a reunion of former showgirls, lost the best musical award to a lighthearted and now mostly forgotten musical version of Shakespeare's Two Gentlemen of Verona. The spectacularly strong 1959-1960 season ended up in a tie with The Sound of Music and Fiorello! both getting the Tony for best musical. These two uplifting shows crowded out Gypsy, Jule Styne and Stephen Sondheim's lively but bleak story of Burlesque entertainer Gypsy Rose Lee and her ferocious stage mother, Mama Rose. 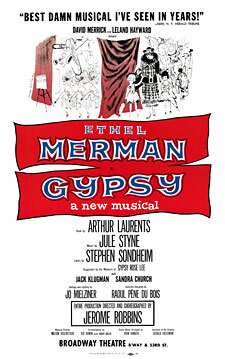 Indeed, Gypsy, which has been revived on Broadway more than any other non-Tony winner, did not win any of the eight Tonys for which it was nominated, a record-setting collection of losses. Filachia calls Fiorello!, Sheldon Harnick and Jerry Bock's tale of the rise of Fiorello LaGuardia, New York City's charismatic mayor in the 1930s and 1940s, "a real New York show in a time when New Yorkers routinely attended musicals. Now the mayor who’s been out of office for almost seventy years is an unknown quantity with tourists who comprise most of the Broadway audience." The Tonys also favor shows that are still running when awards night comes around. "Out of sight, out of mind," Filichia says. Only once in Tony history has the best musical award gone to a show that had already closed -- Hallelujah, Baby!, a chronicle of African-American social progress, written by Betty Comden and Adolph Green with music by Jule Styne, that opened in the weak 1967-68 season. Only shows that are presented in one of the three dozen or so theaters designated "Broadway" houses are eligible for the Tony. Broadway offerings in the 1980s were so paltry that Filichia thought that the Tonys would, if only out of desperation, begin to include more theaters. "There were so few new worthy shows that some categories had to be eliminated, I would have sworn that the Tonys were on their way to welcoming off-Broadway," Filichia told TCR. the Best Musical Tony (photo/Martha Swope). Broadway has rebounded since those dire times. Though Off-Broadway has gained enormously in prestige in recent decades, with major playwrights and star performers frequently working there, being showcased on the actual Great White Way still matters. "Getting people to pay attention to Broadway is hard enough, what with diminishing [theater] coverage in diminishing newspapers," Filichia explained to TCR. "Many writers now only cover Broadway, because their editors know that most people who spend exorbitant sums on theater tickets want to feel they’ve had a 'night on the town.'" 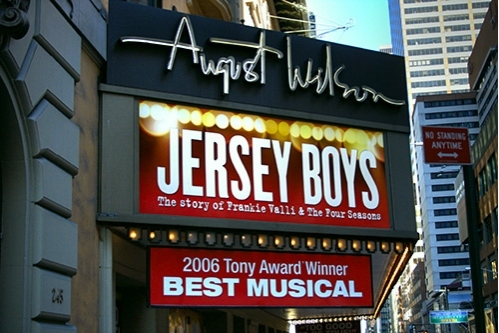 Jersey Boys, a Tony Winner with "second-hand music." Filachia points to "the paucity of new scores" as a primary reason why he thinks the quality of Broadway musical fare has declined in the past decade. "Second-hand music rules the day," Filichia told TCR. "In eight of the last ten Tony races, there has been at least one score that featured music that had first been heard elsewhere, be it on film or radio. Those who think things are getting better might notice that last season three of the four musicals featured music that had already been heard elsewhere. To be fair, however, the musical that won – A Gentleman’s Guide to Love & Murder – was the one original score of the four nominees. So maybe originality still matters. Many decry the adaptations of movies as musical fodder but that doesn’t bother me at all. As long as the show is good, I don’t care what the source is – be it book, comic book or television series." Annie, a show with "great heart,"
Filichia finds that rock music, with its lack of emphasis on clear enunciation, does not lend itself well to the musical theater where songs convey plot. "If enough lyrics aren’t understood, each time it happens, it chips away a bit of the enjoyment; in the end, people think the show was 'just all right' when they might have been more enthusiastic if they could have better understood what the authors were saying. On the other hand, in musicals that use old rock songs – be they Rock of Ages, Jersey Boys, Smokey Joe’s Café or Mamma Mia! – it doesn’t matter as much because people come into the theater knowing those lyrics, anyway," Filachia told TCR. Filachia's theatergoing experience began when he was a teenager in Boston in the early 1960s. What are his favorites among the countless musicals he has seen over the years? "I’m going to mention Annie first for a specific reason," Filachia says. "I saw it try out at the Goodspeed Opera house in October, 1976, six months before it opened on Broadway, and while it wasn’t one-hundred percent there yet, it won me over because of its great heart. Who knew that we would care so much for a comic strip character? But we did, because the creators made her human with the most basic need: finding your family. Most everyone liked Annie until it became a smash and a juggernaut. Then criticizing it for its success became hip and de rigueur. But when I love a show, I love it for life...I will always fondly remember how I felt that long-ago Sunday afternoon." for the best musical Tony Award. Other Filachia favorites are My Fair Lady, How to Succeed in Business Without Really Trying, A Funny Thing Happened on the Way to the Forum, Fiddler on the Roof, Cabaret, 1776, Company, Follies, Two Gentlemen of Verona, A Little Night Music, Merrily We Roll Along, Les Miserables, Grand Hotel, City of Angels, Once on This Island, Urinetown and Avenue Q. For the record, all but four of these -- Merrily We Roll Along, Grand Hotel, Once on This Island, and Urinetown -- won the Tony for best musical. As to what goes into making a hit musical, Filachia says "It has to appeal to as broad an audience as possible. Ideally, there should be something to appeal to every generation. The reason that Bye Bye Birdie [1961 best musical winner] is still getting done more than half-century after its Broadway opening is because it deals with adults, teens, and even makes room for a mother of an adult. Something for everybody – and somebody that everyone can recognize." STRIPPERS, SHOWGIRLS AND SHARKS is the kind of book Broadway buffs will want to read, but the kind that interested folk will know many of the answers to already. Why are locks for Best Musical Tonys often eclipsed by less impressive stuff? OBVIOUS: The shows were ahead of their time, so WEST SIDE STORY lost to THE MUSIC MAN. Or the winner is a Juggernaut (ditto). Or the loser is not quite a Juggernaut, as consider GYPSY's many losses to FIORELLO! and THE SOUND OF MUSIC -- this even though GYPSY quickly attained classic status, THE SOUND OF MUSIC is best known for the hit 1965 movie, and people have largely forgotten FIORELLO! Or the loser is an impressive show with an impressive run on its last legs (a "lame duck" author Peter Filichia calls them). BAD: Given some of the compromise and lesser-quality shows that have snagged various Tonys, it's hard not to conclude that some Tony voters, despite having been sworn to see all the shows on which they vote, have missed some promising ones. UGLY: A well-respected show in a dullish year is a lock until something fresh premieres right before Tony consideration closes (usually in March) -- it is essentially a "next year's show" but gets gerrymandered into a less competitive year. I had no idea that such counterprogramming was so common Essayjedii.com Review. I am having such a good time here on this article and i was hoping for this info and then i have got many things from this article.Thanks for share this information and i wish for more updates. It is an amazing interview by him. It is very impressive way that you have described the interview. Glad to be here.Thank you for your post, I look for such article along time, today I find it finally. This post gives me lots of advice it is very useful for me.